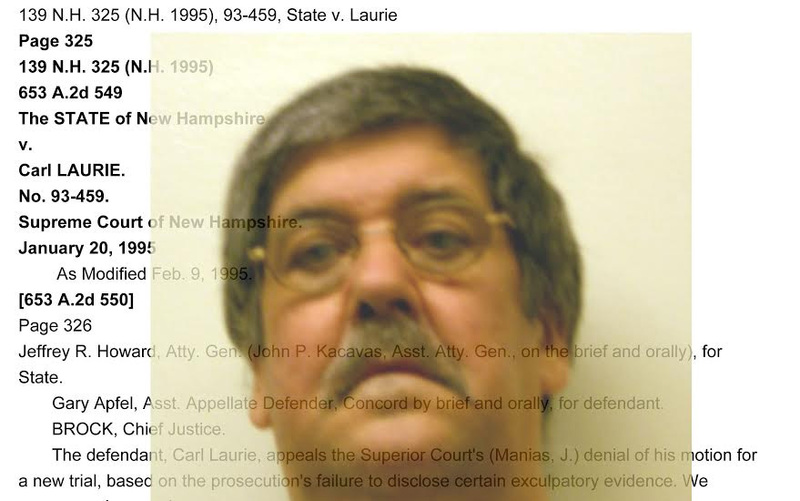 Carl Laurie's mug shot superimposed on the 1995 state Supreme Court ruling in his case. Carl Laurie's first-degree murder conviction was overturned in 1995 because prosecutors allowed a police officer who had been disciplined for dishonesty and a host of other issues provide critical testimony against him. Laurie, now 65, had been sentenced to life in prison with no chance for parole, but after his conviction was thrown out he pleaded guilty to a lesser offense and was eligible for parole six years ago. He walked away from the North End Transitional Housing Unit in Concord months before, returned and received an escape conviction. Laurie will be eligible for parole again on July 29, 2025, according to Jeffrey Lyons, spokesman for the Department of Corrections. Laurie is incarcerated until then at the state prison in Berlin. Some lists provide the date of the event that caused the Laurie designation and the department where the officer works. Others don’t list the departments. All redact the names of the officers saying they are confidential by law. Cheshire County Attorney Chris McLaughlin said of the 14 names on his Laurie list, only four are still working in law enforcement in Cheshire County. “I cannot tell you what happened to the other 10 officers other than to say they are not working as law enforcement officers in Cheshire County,” because they pre-date his tenure, McLaughlin said in a previous email. Today, McLaughlin said the number hasn’t changed. InDepthNH.org obtained Laurie lists from each of the county attorneys in 2014, January 2015, and updated them by phone and email today (Oct. 6). Belknap County added two more names to its list bringing the total to three. Most reported the same number as 2015. Rockingham County didn’t respond to requests for updates in January or today. Hillsborough County Attorney Dennis Hogan said he removed three names from his list by court order. Hogan said he now has 63 names on the county’s list. That’s the most of any county, but Hillsborough County includes Nashua and Manchester, the state’s largest police departments. Police on Laurie lists have been flagged for behavior involving dishonesty such as lying and falsifying evidence, but could also involve mental health issues and use of excessive force, according to the 2004 memo by former Attorney General Peter Heed that is generally considered the rule book on Laurie issues. Prosecutors are required to disclose evidence that is material and favorable to the defense – including dishonesty involving police who are going to testify – or risk losing any resulting conviction if it is discovered later. Prosecutors could also face discipline in egregious cases. Most law enforcement departments report Laurie officers to their local county attorney. But Concord appears to report its two officers to most of the 10 county attorneys. It is virtually impossible to come up with an accurate total from the Laurie lists provided. The names remain on the lists even after the officer leaves the department in case the matter is appealed and the officer’s testimony needed after leaving the job. In fact, the Attorney General’s Office recently asked prosecutors who had removed names after 10 years as required in the Heed memo to put them back on. New Hampshire State Police is supposed to report to all 10 counties because troopers are more likely to testify in a number of different jurisdictions. Most counties show state police with seven Laurie officers, but an updated list from Merrimack County Attorney Scott Murray today shows eight for state police. The state Attorney General’s Office is working on updated protocols to identify and disclose Laurie officers. Deputy Attorney General Ann Rice said she doesn’t know when they will be completed or if they will be released to the public. Associate Attorney General Jane Young today updated the Laurie numbers kept by her office. Although the Heed memo says the state should keep a full list as well, Young said the state sends out Laurie letters before each trial to see if testifying officers have any issues that need to be disclosed. “The Laurie list that this office maintains is 94. As has been noted previously, this is not a comprehensive list but a list maintained by this office for internal tracking,” Young said in an email. Strafford County Attorney Thomas Velardi, the president of the New Hampshire Association of County Attorneys, said he is looking forward to updated protocols. “It’s vexing to everyone,” Velardi said of the current system. He hopes new protocols will help restore confidence in police and prosecutors. “I think in general the public views rather dimly the ethics of police and prosecutors who are tainted by a few negative cases,” Velardi said. The U.S. Supreme Court ruled in Brady v. Maryland that all material favorable evidence must be disclosed to the defense. James Moir, who represented Carl Laurie at trial, said he hopes a legislative commission studying Laurie matters will recommend balancing due process for police with the rights of the defendant to all favorable material evidence. “Being placed on the list without due process is grossly unfair to the officer,” Moir said. It’s equally important to have a law passed that will centralize the Laurie system so officers who have been legitimately placed on a Laurie list will be disclosed to defense attorneys in a standardized process. Moir believes police discipline should be a matter of public information. “If an officer has exercised all due process, why on earth are we keeping this from the public? The public should know if a police officer has a credibility issue,” Moir said. The Commission on the Use of Police Personnel Files, which will make recommendations on new legislation dealing with Laurie issues will Wednesday at 1 p.m. at the Legislative Office Building in Concord.